The great thing about web apps is that you can access all of your information on the go, and we’ve introduced ways to use Google Apps on a variety of devices like mobile phones and tablets. But it’s inevitable that you’ll occasionally find yourself in situations when you don’t have an Internet connection, like planes, trains and carpools. When we announced Chromebooks at Google I/O 2011, we talked about bringing offline access to our web apps, and now we’re taking our first steps in that direction. Gmail offline will be available today, and offline for Google Calendar and Google Docs will be rolling out over the next week, starting today. 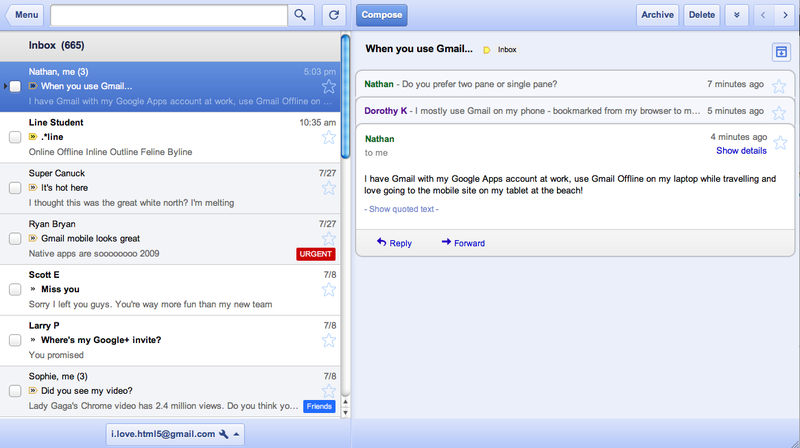 Gmail Offline is a Chrome Web Store app that’s intended for situations when you need to read, respond to, organize and archive email without an internet connection. 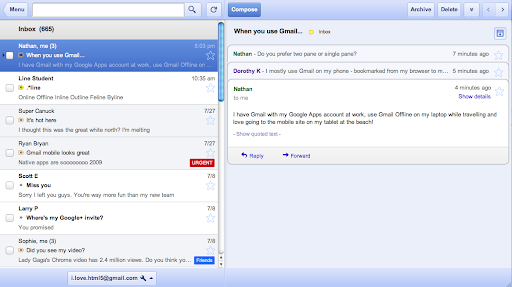 This HTML5-powered app is based on the Gmail web app for tablets, which was built to function with or without web access. After you install the Gmail Offline app from the Chrome Web Store, you can continue using Gmail when you lose your connection by clicking the Gmail Offline icon on Chrome’s “new tab” page. Google Calendar and Google Docs let you seamlessly transition between on- and offline modes. When you’re offline in Google Calendar, you can view events from your calendars and RSVP to appointments. With Google Docs you can view documents and spreadsheets when you don’t have a connection. Offline editing isn’t ready yet, but we know it’s important to many of you, and we’re working hard to make it a reality. To get started using Google Calendar or Google Docs offline, just click the gear icon at the top right corner of the web app and select the option for offline access. IT administrators can deploy Chrome Web Store apps to users en masse by setting uporganizational policies for Chrome. Today’s world doesn’t slow down when you’re offline and it’s a great feeling to be productive from anywhere, on any device, at any time. We’re pushing the boundaries of modern browsers to make this possible, and while we hope that many users will already find today’s offline functionality useful, this is only the beginning. Support for offline document editing and customizing the amount of email to be synchronized will be coming in the future. We also look forward to making offline access more widely available when other browsers support advanced functionality (like background pages).